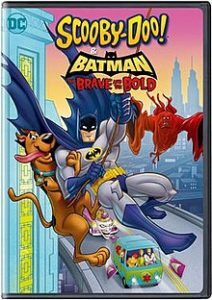 Scooby Doo & Batman: The Brave and the Bold pairs up the mystery-solving Great Dane and his crime-stopping pals with the caped crusader. After an unsolved case from Batman’s past comes back to haunt him, and the mysterious Crimson Cloak threatens to take over Gotham, Batman recruits Mystery Inc. to help crack the case. Will their teamwork be enough to solve the mystery and foil the plans of the most dangerous rogue villains the world has ever known? Pack your utility belts with gadgets and Scooby snacks to find out, as you takeoff for a wild crime-busting thrill ride of a caper! And jinkies! I have a copy to give away! Send me an email at moviemom@moviemom.com with Scooby in the subject line and tell me your favorite cartoon show. Don’t forget your address! (US addresses only). I’ll pick a winner on January 16, 2018.